Woo! We reached our first Patreon goal in December! That means there will be 2 new Minimumbles every week in January! If you want to help make it happen again in February head on over to my Patreon and toss $1 into the hat! The shirt is now available at bumblemumble.com !!! Where can I get a DSL modem/router with that logo? Which providers do support the POI (Pizza Over Internet) protocol? 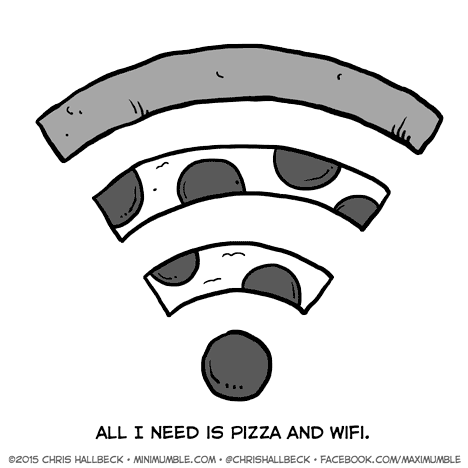 Ordering more pizza is one of the original reasons for inventing wifi, or so I just made up. Actually, the pizza-related main reason for inventing wifi has more to do with the exit than the entrance. I forgot another really important point: uninterrupted online experience while answering the door for the pizza delivery robot (or was it guy? can’t tell anymore). I need a sticker of this for all my devices.